We’ve had some fun during these anniversary updates, but it’s time to wrap it up, B! 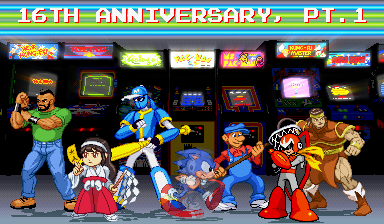 – Sega: Sonic the Hedgehog, who decided to take off right as I took the pt.1 picture and that other sprite of his hasn’t shown up yet. – Marvel Comics: a new Wasp sprite. Don’t worry, I’ll make more outfits for her later! – G.I.JOE: Snake-Eyes and Scarlett. BTW: an early version of Scarlett’s sprite was in the unannounced new banner displayed only on July 4th this year. 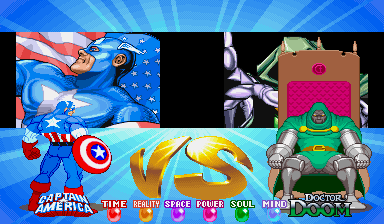 All those sprites were added to the GFX Generators (the old GroupShot and Vs generators). that Chun-Li pic I drew last month is now in the prints section of the site’s Shop page! Well, I’m done waiting for Sonic, so now it’s to debut the brand-new mission statement video! … Hey, there’s the other Sonic sprite! It’s in the gallery and GFX Generator, too! I hope you had fun with these updates! 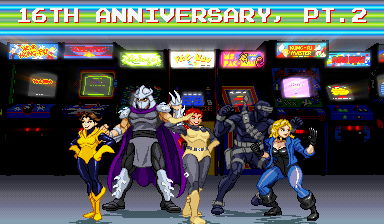 The first anniversary update was all gaming characters, but now it’s time give a few comic and toy license characters some love! All sprites were added to the aforementioned GFX Generators (the old GroupShot and Vs generators). Wasp’s new sprite has slightly different colors than her 2011-2012 sprites, but I remade all her old palettes, because Jan’s gotta switch things up. Snake-Eyes’ new sprite also has multiple palettes. Also: that Chun-Li pic I drew last month is now in the prints section of the site’s Shop page! So we saw video game heroes yesterday and 80s nostalgia today, but things take a turn for the sinister tomorrow with an all-villain update! All AmeriCon Convention and Generator progress. Sorry for the lack of updates, but I’ve been getting ready for the the All AmeriCon convention in Warren, Ohio (click the link to find details on their Facebook page). 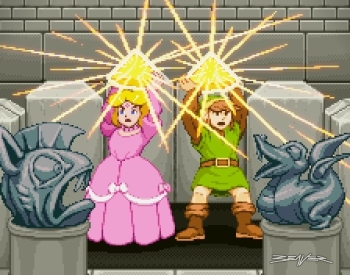 The Legend of Zelda pic is based on the NES ending and, well, you’ll see this in something else I’m working on for the site. 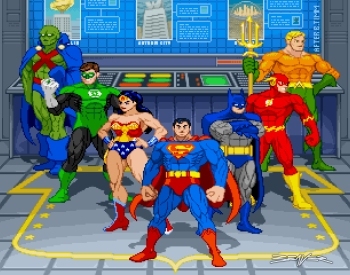 The JLA print has sprites (or variations of them) I made from scratch before with a few all-new sprites and an all-new background. Again, they’re available in the site’s shop and I’ll have them with me at the All AmeriCon convention this weekend! I’ve got the oval and sprite-shaped shadows working and the reflections are next. It’s taking a lot of time to unravel my crappy old coding to replace with my current level of crappy coding, but it’s good to have it at 75% of what the original version does. Comments Off on All AmeriCon Convention and Generator progress.